The last few days I’ve had this thought running through my head that it’s time for what will probably become an annual “pep talk” for our customers, or more like a primer of what to expect from us, how you can help, and how you shouldn’t help out. This is the time of year when projects start coming out of the woodwork, and of course everybody wants to save a little time and money. Then this morning I realized it’s April 29th. 31 years ago I raised my shaky right hand and said I thought it’d be a good idea to join the Air Force and head off for basic training. Luckily my hand stopped shaking after a week or so, and the Air Force gave me quite an adventure. Alright, enough of that. What we really need to talk about is ALUMINUM. Aluminum is a fantastic metal because it’s both light and strong. It’s also finicky to work with. The thing is, it likes to be clean and pure, and yet the only time it’s ever clean and pure is the first 10 seconds after it comes out of the mill. It builds up an oxide layer that lends to it’s “self-healing” properties, but that oxide layer has to be removed or broken through for a good weld to happen. The older the aluminum is, the deeper the oxide layer. Then factors like water, salt, and corrosives just add to the problem. In the case of a pontoon boat, pond scum, zebra mussels, algae, water, and oxidation are all big problems when it comes to making a repair. I always TIG weld pontoon boats because the process gives me an opportunity to know how the weld is shaping up as I go along. Essentially I don’t add filler metal until I can see that the aluminum is ready and willing to take it. So how do you clean this nasty stuff? Well I’ve had many customers assume that the best way is with a wire brush, and I guess they’d be semi-correct, if they weren’t intending to use that old wire brush they’ve been using to clean their barbecue grill. Remember, aluminum doesn’t like contaminants, and anything that isn’t aluminum is considered a contaminant. Microscopic iron particles that come off that wire brush will be contaminants. You’ll be proud of how shiny the aluminum looks, but then it’ll be such a mess on a microscopic level that it’ll be almost impossible to weld. So here’s the trick: Let Gary clean it. Simple enough, right? The thing is, I keep tools set aside especially for aluminum and labeled as such, so that they don’t introduce contaminants. I use special abrasives that don’t leave contaminants behind, and I have my way of making that aluminum cooperate. Trust me, if you let me clean your aluminum it’ll save you a ton of money over having me clean up any surprises you’ve left me through your good intentions. The other thing about TIG welding on boats is you have to get the water out. Water causes the weld to essentially explode during the welding process, and oxidizes the aluminum such that it becomes impossible to weld. The best way to drain water is to drill a hole in the very bottom and just let it drain, then remind me you’ve drilled a hole when I come to make the other repairs so I can fill it back in. Make sure your hole is at the very bottom, not just a little below the area that needs repaired. The reason for this is that you want your pontoon as empty as possible, and also it makes it possible for all the water to drain out so I can make a successful repair of the hole you just drilled. After you drill the hole, be patient. The was a customer last fall who’d hoped his boat was a quick fix, but it had literally a ton of water in it, and after three hours it was still draining and I had to make a return trip. That’s the big subject for this week. A smaller but no less important subject is welding safety. Because most of our work is outside we’re subject to the whims of Mother Nature. I can honestly say I’ve welded in every kind of weather imaginable, from hurricanes to oppressive heat to blizzards. I can also honestly say that it wasn’t good for me OR my equipment. 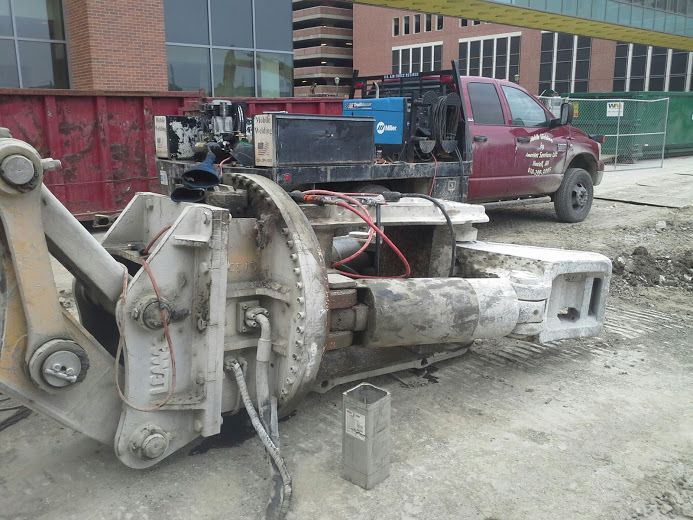 The biggest example of that is the welder I blew up last winter by welding during a blizzard. Sure, it was important to do the job, but was it $6,000 worth of important? Probably not. It could have waited for a better day. That’s not to say that I won’t work on your project in bad weather. It just means that I have to take steps to protect myself, my employees, innocent bystanders, and my equipment. If I waited for perfect weather in Michigan I’d never get anything done. It’s more a matter of making judgment calls on a daily basis. For instance, it’s impossible to TIG or MIG weld in the wind, but sometimes a tarp can make things more manageable. Stick welding in light rain isn’t too bad and again, a tarp makes a big difference as long as other precautions for safety are implemented. 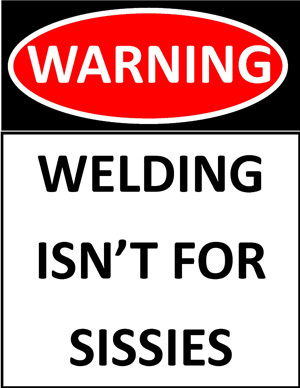 However, you couldn’t pay me to TIG weld aluminum in the rain or on wet ground…the high frequency unit makes 30,000 volts that’s backed up by a welder that can make 300 amps. That’s a recipe for Kentucky Fried Gary for sure! Again, I make judgment calls every day and always try to err on the side of safety of people and equipment. As I look out at the rain coming down this morning I realize that my constant watch of the forecast has paid off again. Today I’ll be going to quote a job and then working inside. I’m hoping for a little relief on the weather because there is some outside work to do this week, but the forecast isn’t supporting that. We’ll have to just see how it works out. Maybe this stationary front will move a little to the east and be Somebody Else’s Problem. Meanwhile, rest assured we’re taking phone calls and scheduling work as usual. The rain never stops the flow of business. Give us a call and let’s solve your problems!